Maggie Kennedy couldn’t stop smiling Tuesday night after hearing she received 56 percent of the vote to secure the Student Government Board presidency for next year. Kennedy, a junior political science and communication major running on the Horizon slate, received 1,889 votes to defeat junior marketing major Saket Rajprohat for the position. Compared to last year’s almost 29 percent voter turnout with three presidential candidates, this year saw just 18 percent of the student body cast votes — a decrease to 3,481 students from last year’s 5,177. But Kennedy said both slates with presidential candidates — Horizon and Neighbors — worked hard to ensure students knew their respective platforms leading up to the election. Skip to 28:20 for the results. Current SGB President Max Kneis tried to move through allocations requests quickly during Tuesday night’s weekly public meeting after accepting a motion to bypass board reports from then-board member candidate and current Allocations Chair Cory Stillman. The room was packed with candidates and supporters awaiting the results of the annual election. Delaney Regan, a junior psychology and English writing major, served as the campaign manager for the Horizon slate and said she voted for all Horizon candidates. Jahari Mercer, a junior industrial engineering major, was overjoyed and cried triumphantly upon hearing he received 1,265 votes — more than any other board candidate — meaning he will serve as executive vice president next year. He then stepped aside to call his parents and deliver the good news. Jessa Chong, a sophomore political science and communication major, received the second highest number of votes with 1,137. Junior biology major Pooja Humar came in third with 1,094 votes and Stillman, a sophomore film studies major, finished just four votes behind her with 1,090. Rajaab Nadeem, a junior economics and political science major, finished in fifth with 1,057 votes and sophomore accounting and finance major Cole Dunn received 944 votes. Zechariah Brown, a junior political science and economics major finished with 696 votes and sophomore computer science major Albert Tanjaya finished with 631 votes. Voters also answered a referendum on a change to the SGB constitution. The changes were mostly to the document’s formatting, and the referendum passed 2,592–137. 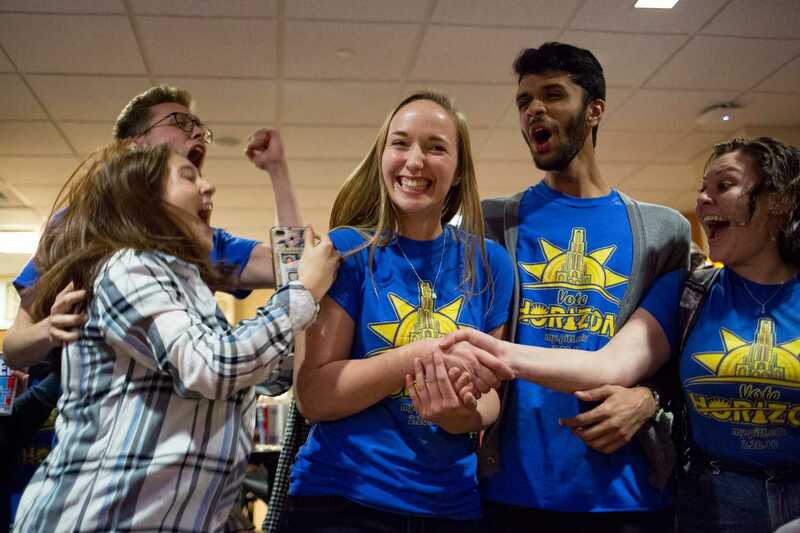 Nadeem, a board member-elect from the Horizon slate, was “absolutely ecstatic” about winning. This will be his first involvement with SGB. “I’m excited and I’m looking forward to learning the ropes from the many experienced people around me, especially on my slate, from Maggie, from Corey [and] from Jessa,” Nadeem said. When asked what he hopes SGB looks like after next year, Kneis said he hopes the open educational resource initiative, which SGB introduced at its public meeting Jan. 9, expands and becomes more popular. After the election results were announced, Rajprohat, who is a former Pitt News columnist, declined to be interviewed. Executive Vice President-elect Mercer, who ran with Rajprohat on the Neighbors slate, said the loss was difficult for the slate’s other candidates but they were accepting the mixed results as a team. Club Powerlifting Team requested $2,000 for airfare for 15 people to attend Collegiate Nationals. The board approved in full. Panther Judo Club requested $1,236 for registration, ground transportation and lodging for their 2018 USA Judo Youth National Championship. The board approved in full. Panthers for Animal Welfare requested $93.50 for a purchase, rental and service. The board approved in full. College Republicans requested $2,240.09 for registration, ground transportation, lodging, parking and meals for CPAC 2018. The board approved $1,620.09 and denied $620. Hindu Students Council requested $1,200 for a purchase, rental and service. The board approved $1,160.80 and denied $39.20. Pitt Triathlon requested $1,592 for lodging for 15 people to attend USAT Collegiate Club Nationals. The board approved in full. Exercise Science Club requested $3,256 for ground transportation and lodging for their ACSM International Health and Fitness Summit. The board approved $657.90 and denied $2,598.10. Pitt Men’s Club Soccer requested $581 for a competition expense. The board approved in full. Panther Crossfit requested $800 for general travel. The board denied in full. Animal Lovers Club requested $400 for general travel. The board approved in full. First Class Bhangra requested $350 for a competition expense. The board approved in full. Pittsburgh Women’s Volleyball Club requested $916.84 for a purchase, rental and service. The board approved in full. Student Slovak Club requested $900 for a program expense. The board approved $730 and denied $170. FORGE requested $998 for a program expense. The board approved $578 and denied $420. Panther Team Handball Club requested $288.08 for general travel. The board approved in full. Ski and Snowboard Team requested $1,373.14 for lift tickets, race fees, gatekeeper fees and ground transportation for their Regional Conference Championship. The board approved in full. Panhellenic Association requested $2,370 for registration for their Northeast Greek Leadership Association Conference. The board approved in full. Muslim Student Association requested $3,244.84 for honorarium, airfare, lodging and custodial fees for their annual Fastathon. The board approved $3,222.94 and denied $21.90. Robotics and Automation Society requested $11,688.56 for their Aerial Robotics Project expenses. The board approved $6,362.05 and denied $5,326.51. Robotics and Automation Society requested $2,065.68 for ground transportation and lodging for their International Aerial Robotics Competition. The board approved in full.